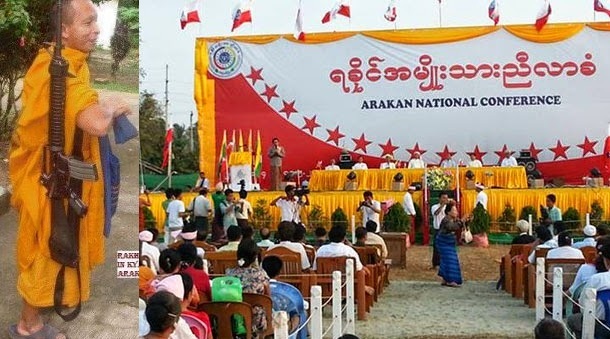 JNN 07 May 2014 ARAKAN – Meeting at a recent conference in Arakan State’s Kyaukphyu Township, Buddhist politicians, monks and community leaders have called for the creation of an “Arakan National Defense Army” that would Used against the state’s persecuted Muslim minority. “This decision came out from our analysis of the current situation in our region,” Nyi Nyi Maung, a spokesperson from Arakan National Conference, was quoted by The Irrawaddy news site on May 3. The suggested army was proposed by Buthidaung Township representative Tun Aung Thein who called for urging the central government to allow the creation of the Arakan National Defense Army. The conference was attended by Union Parliament Speaker Shwe Mann and the President Office’s Minister Aung Min, who is usually tasked with holding peace talks with ethnic armed groups. Burma Rohingya Muslims have come under several violent episodes led by Buddhist mobs over the past two years. The latest attack occurred over the past few days when UN humanitarian chiefs and human rights organizations reported credible evidence of a massacre of at least 48 Rohingya Muslims, mostly women and children, in Burma’s western Rakhine State. Official media and the Ministry of Information have strongly refuted the reports. Yet, a Thailand-based NGO, the Arakan Project, said it had received multiple reports that dozens of Rohingya Muslims were killed by security forces and Arakanese Buddhists. The incident, just the latest in a string of attacks that left at least 240 people dead and more than 140,000 homeless or displaced in prison-like camps, caused terror in the Muslim Yangon community. At the five-day conference, which wrapped up on Thursday, congregants seemed decisive on forming a new Buddhist army to protect their communities. “In Buthidaung and Maungdaw, we have very few of our Arakanese people. Therefore, we have no security. Our people face threats almost every day even though there are police and army,” said Tun Aung Thein, the Buthidaung representative. The conference is held amid an ongoing, deadly conflict, which has pitted the state’s Arakanese Buddhists majority of about 2.3 million people against the approximately one-million strong Rohingya Muslim community in northern Arakan. Hundreds of thousands of Muslims have been forced to flee their homes in western Burma since June after attacks from Buddhist mobs on their areas. The violence has displaced nearly 29,000 people, more than 97 percent of whom are Rohingya Muslims, according to the United Nations. This entry was posted in Asia Pacific and tagged Arakan, Arakan National Conference, Arakan State, Buddhist Militants, Burma, Buthidaung Township representative Tun Aung Thein, Extremist Buddhist, National Defense Army, Rakhine, Rohingya, Rohingya Muslims. Bookmark the permalink.